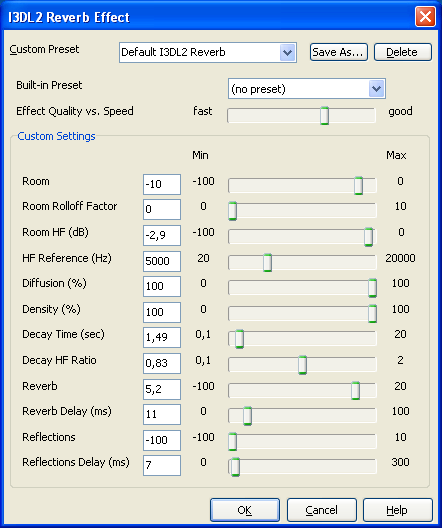 I3DL2 Reverb FX, also known as Interactive 3D Audio Level 2 reverberation, places sounds outside the stereo basis. Attenuation of the room effect, in millibels (mB). Rolloff factor for the reflected signals. Attenuation of the room high-frequency effect, in mB. Reference high frequency, in hertz. Echo density in the late reverberation decay, in percent. Modal density in the late reverberation decay, in percent. Ratio of the decay time at high frequencies to the decay time at low frequencies. Attenuation of late reverberation relative to Room, in mB. Time limit between the early reflections and the late reverberation relative to the time of the first reflection, in seconds. Attenuation of early reflections relative to Room, in mB. Delay time of the first reflection relative to the direct path, in seconds. Submitted by Alice Melo on Mon, 01/30/2017 - 21:07. Submitted by February 2017 Calendar on Mon, 01/23/2017 - 11:47. Submitted by hlrkis on Sun, 11/27/2016 - 08:16. Submitted by nina on Sat, 11/19/2016 - 20:51. Submitted by Roy on Mon, 09/19/2016 - 14:11. I guess I don't quite catch what Room Rolloff Factor means. Which reflected signals are presupposed here? Submitted by nikhil sharma on Sun, 09/04/2016 - 10:53.
i really love to use this. Submitted by Routy on Fri, 09/02/2016 - 19:44. Thanks guys! I'll recommend this page to my friends . Submitted by Roger on Fri, 08/26/2016 - 17:23. Cool program. I like the old-fashioned design. Are you going to upgrade it? I just hate Windows 10's one and noticed a tendency in last android applications design to change for worse. Check out one I developed for custom writing page. What's your opinion?